Ingredients: Chicken broth, chicken, chicken liver, ocean whitefish, sweet potato, green bean, dried ground pea, chickpea flour, pea fiber, carrot, spinach, apple, guar gum, ground flaxseed, menhaden oil (preserved with mixed tocopherols), salt, potassium chloride, pumpkin, cranberry, choline chloride, blueberry, cassia gum, xanthan gum, zinc proteinate, iron proteinate, thiamine mononitrate, vitamin E supplement, copper proteinate, manganese proteinate, sodium selenite, cobalt proteinate, niacin supplement, d-calcium pantothenate, vitamin A supplement, riboflavin supplement, biotin, vitamin B12 supplement, potassium iodide, pyridoxine hydrochloride, vitamin D3 supplement, folic acid, rosemary extract. 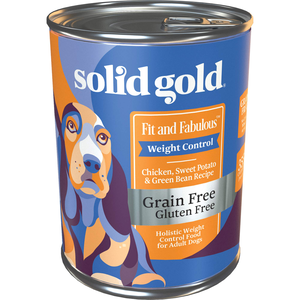 Solid Gold Fit and Fabulous Weight Control - Chicken, Sweet Potato & Green Bean Recipe is formulated to meet the nutritional levels established by the AAFCO Dog Food Nutrient Profiles for the maintenance of adult dogs. We'll begin this review of Solid Gold Fit and Fabulous Weight Control - Chicken, Sweet Potato & Green Bean Recipe with a detailed discussion of the ingredients. The third ingredient is chicken liver. Chicken liver is an excellent organ meat which provides high quality protein and fat. In addition, chicken liver provides many essential vitamins and minerals. The fifth ingredient is sweet potato. Sweet potatoes are a common gluten free carbohydrate source in pet food. In addition to its fiber content, sweet potatoes are an excellent source of beta carotene, an important antioxidant which serves as a precursor to vitamin A. Because ingredients are listed in order of pre-cooked weight, the remaining ingredients in Solid Gold Fit and Fabulous Weight Control - Chicken, Sweet Potato & Green Bean Recipe are not as important as the first five ingredients. Next we have green bean. Green beans are naturally rich in dietary fiber and numerous vitamins and minerals. They also supply a notable amount of plant based protein. The next ingredient is dried ground pea. Dried ground peas are naturally rich in an important antioxidant called beta carotene which is a precursor to vitamin A. Dried peas also provide dietary fiber and a notable amount of plant based protein. The remaining ingredients in this Solid Gold Fit and Fabulous recipe are unlikely to affect the overall rating of the product. The official PawDiet rating for Solid Gold Fit and Fabulous Weight Control - Chicken, Sweet Potato & Green Bean Recipe is 5.0 out of 5.